Valentine's Day around the corner,and while we enjoy our flutter of hearts,here's a list of top 10 valetine destinations you'd love to try and stay at. Arunachal Pradesh : Enjoy the mighty river Kameng at Bhalukponk,Orchid Museum at Tipi and Sessa,Monastries at Bomdila,Hot water spring apple and kiwi orchard at Dirang.Enjoy the misty sela pass,fishing at Nurannang,lakes at tawang,Valleys at Riong,river raft at Subansiri river.A romantic gateway to the destination unexplored. Andamans:Discover neil island at Andamans,walk on the pristine beaches of havelock,ride on a elephant at elephant beach,visit marine national park,scuba dive in andamans,mud volcano at Batarang Island,cycle at long island. Go for hot air ballooning,Roam around Jaisalmer fort.The options are plenty.Live your life up in grand haveli's. 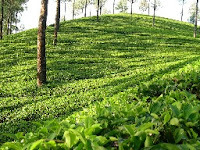 Munnar:Enjoy the panaromic view of tea plantation,the and Indo-Swisss Live Stock project lake at Mattupetty.Shout at Echo Point.Anamudi, the highest peak south of the Himalayas, towers over the sanctuary in majestic pride. The slopes of the hills abound in all kinds of rare flora and fauna. Go to Anamudi for a relaxed Evening. Kodaikanal:Go horse riding,mountaineering,fishing and shopping in the town.The Kodaikanal hills are a getaway from the hustle and bustle of the townsfolk. The various species of birds and flowers can be watched by the nature lovers who can engage in a leisurely stroll down the mountain ranges of the Western Ghats.Walk along the coaker's walk,enjoy the view of pillar rocks. Lakshwadeep:Have fun with various water sports activities at agatti island that includes scuba diving, snorkeling, deep sea fishing, lagoon fishing, speed boating, sail boating, glass bottomed boat sail, boat excursion to islands & kayaking. Bangaram island has been ranked among the best getaways of the world.Enjoy the magical spell of Bangaram Island.Island hop in a helicopter or a boat. Darjeeling:Enjoy the views from the tiger hill,situated at 2590 metres,this spot has earned international fame for the magnificent view of the sunrise over the "Kanchanjunga" and the great eastern Himalayan Mountains. Even Mount Everest, the world's highest peak, is visible from here.Enjoy the toy trains at the batasia loop. The Batasia loop situated almost 5 km away from the town is a gigantic railway loop where the Toy Train makes a 360 Degree turn.Watch the musical fountain at chowrasta.Meditate at Peace Pagoda. Goa:We all know goa,don't we.The long and isolated stretch of Agonda Beach is perfect for those looking to get away from it all.Anjuna Beach was once home to the hippies.Listen to trance at anjuna.Visit arambol beach,the new hippie haven.north of Arambol are the deserted Keri beach and Tiracol Fort. It's worth the walk there if you want total peace and privacy.Enjoy nightlife at baga,and flea market at calangute.Visit Candolim beach for the bars.Visit vagator beach for disco valley. Kabini:Wander around the lap of nature at kabini. Behind the background music of flowing river water you can take a jeep safari or a cicada ride to experience thrilling suspense in seeing wild animals mooching around you at any moment. Srinagar: Enjoy the shikara ride in semi frozen dal lake,rent a motorcycle and roam around,get mesmerised by the beauty of shalimar baag,have the delicious local cuisine. Did you love my comprehensive list on valentine destinations.Drop in a comment,of any new destination you'd like to see in the list.